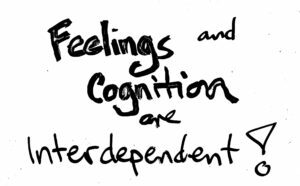 What If Feelings and Cognition Are More Interconnected Than We Realize? 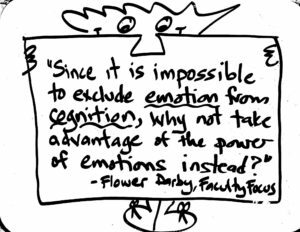 Emotion and cognition are inextricably linked! We academics like to think that it’s possible to learn facts and skills in a totally rational way, divorced from emotion. But that’s just not true! Also, in a separate but related fact of the contemporary world, more and more teens and young adults are being diagnosed with high level anxiety. In this video, I reflect about these two facts, and tell two stories: one from the course I’m teaching for educators, and another from a coaching session with a high school senior. 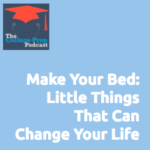 Click here to listen in as Megan talks about little things you can do to change your life. 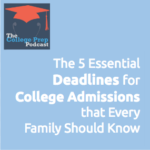 Do you know the 5 essential deadlines for college admissions? Megan has noticed that most of her newest clients seem clueless about what college app dates to pay attention to, and what to ignore, as the school year progresses. So, if you are the parent of a high school sophomore, junior or senior, this episode is for you! We want you to be ultra prepared for what’s coming down the pike in terms of the college admissions calendar. So get out your planner and get ready to look up a bunch of dates and plan your year. For seniors: Applications for college become available August 1. Fill them out by Thanksgiving of your senior year. For seniors: Financial aid forms become available in October; fill them out before Thanksgiving of your senior year. For rising seniors: Finalize your college list by the end of the summer before your senior year, so that you can be on target with the above deadlines. For juniors: Spend your junior year researching the colleges that might go on your list. For rising juniors: Make sure you know when all the ACT and SAT dates for the year are, and plan to take one of the earlier ones. BONUS: For rising sophomores – if you think you might be in the running for a national merit scholarship, plan to take PSAT. Got any questions or concerns on this topic, or any other? Want them addressed on our podcast (free coaching! yes!)? Please email us at collegepreppodcast@gmail.com and tell us all about it. Colleges are increasingly checking out students’ online social media profiles to decide whether they are worthy of admission into their schools. How college and job ready is your social media presence? Looking for more tips about how to get prepped for college? Click here.